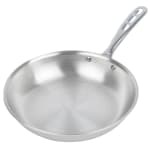 The Vollrath 67110 frying pan has a natural finish over its aluminum construction and cooling vents in the handle that enable the dish to hang while drying. A permanent EverTite™ rivet system provides durability. Whether the pan is used on the stovetop or in the oven, it can withstand temperatures as high as 450 degrees Fahrenheit. Our material for cookware buyers' guide presents the pros and cons of major cookware materials.